If you’ve been having trouble sleeping for a long time and want to improve sleep quality, you’ve probably tried all kind of tricks, pills and other gimmicks to fix this problem. And with every method that fails, you probably grow more and more anxious about it. After all, isn’t good sleep important to your health? And don’t sleepless night ruin your next day? Actually, this may be the misconceptions that are actually keeping you up. Especially if you are also suffering chronic pain. But there is an unexpected twist to this. Researchers from the University of Warwick have just published a study in the Journal of Clinical Sleep Medicine that explains how negative beliefs about sleep can ruin your ability to sleep. The scientists were motivated by the fact that they could not find a reliable test to measure people’s beliefs about the relationship between insomnia and pain. They then invented their own questionnaire to do so. They recruited people who suffered from both chronic pain and insomnia and gave them a collection of questionnaires to complete. – The fifth tested the extent to which pain interfered with their lives. All these questionnaires told a consistent story. The more people in chronic pain worried about their ability to sleep and believed that the pain would prevent them from sleeping well, the worse they slept, and the worse they slept, the more they struggled to cope with their pain. As such, negative beliefs about the relationship between pain and sleep kick off a vicious cycle in which chronic pain and insomnia exacerbate each other. The British researchers took it one step further, giving their participants some cognitive behavioral therapy for pain and insomnia. They wanted to find out whether tackling people’s negative beliefs about sleep and pain would break this destructive cycle. The point of cognitive behavioral therapy is to identify those of your negative beliefs that adversely affect your life and to replace them with new beliefs that will allow you to function better. After the therapy, the study participants held more positive beliefs about the relationship between sleep and pain than before, slept better, and coped better with their pain. Some of the most successful people in the world swear by the great benefits of dozing off for 20-30 minutes in the afternoon. But could grabbing an afternoon nap really make you more likely to develop deadly health conditions such as high blood pressure, high cholesterol and type 2 diabetes? According to a controversial new study from China, the answer might actually be yes. But there is a twist to these results. So what is the truth of this matter? According to the study published in the journal Sleep Medicine that was conducted by Chinese researchers, taking a nap in the afternoon may raise your risk of developing deadly health conditions. The mega-study looked at the health of over 27,000 Chinese people. In China, an afternoon nap is a very popular event to schedule into the daytime activities. What the researchers found was that people who took a nap of longer than 30 minutes every day were more likely to develop high cholesterol and type 2 diabetes. However, most research on the topic of a short nap in the afternoon actually contradicts these findings. I, myself absolutely love the rejuvenating effects of a restful power nap in the afternoon. What most studies agree on, however, is that if you take afternoon naps, it shouldn’t be longer than 30-40 minutes. After that, you enter deep sleep that’s more difficult to wake up from and may prevent you from sleeping well at night. It is clear that more research needs to be done, and an examination of the Chinese study would also be helpful considering there are many other factors and variables to consider that could have influenced the results. In the 21st-century, it has almost become a badge of honor to say that you sleep very little. We have come to admire people who party or work throughout the night. At the same time, we’re obsessed about youthfulness and looking young. Unfortunately, the two issues do not always go hand in hand, if ever. A recent study shows that sleepless nights, whether intentional or insomnia-driven, have some terrible health consequences that are far from admirable or honorable. And it happens on cellular level. In a recent edition of the journal Biological Psychiatry, Prof Judith E. Carroll from the University of California at Los Angeles and a few colleagues published a study proving insomnia could speed up your biological clock, thereby making you develop age-related illnesses earlier – and even die earlier. They started from the well-established fact that people who suffer from insomnia are at higher risk of age-related diseases (like coronary artery disease) and tend to die earlier. This made them wonder whether insomniacs actually age faster than good sleepers. They analyzed information from 2,078 women collected previously by the Women’s Health Initiative study. For a measure of insomnia, they used restlessness, difficulty falling asleep, waking during the night, difficulty falling asleep after waking, early awakenings, short sleep (five hours or less), and long sleep (more than eight hours). Insomniacs will recognize most of these, except for the luxury of long sleep, as a regular part of their existence. For biological age, they used measures called epigenetic age, naïve T cell (CD8+CD45RA+CCR7+), and late differentiated T cells (CD8+CD28-CD45RA-). Completely incomprehensible, of course, but they are simply measures that academics often use to trace DNA changes that affect which genes are activated. They display your age at cellular level. They concluded that postmenopausal women with at least five insomnia symptoms were biologically about two years older than women of the same chronological age. The program will allow you to shake your pesky and unhealthy snoring habit using only easy to perform natural exercises. No drugs, surgery, funky contraptions to sleep with, hypnosis or any other invasive techniques. If you can spend 7 minutes per day performing these exercises you can say goodbye to snoring for good and improve sleep quality. 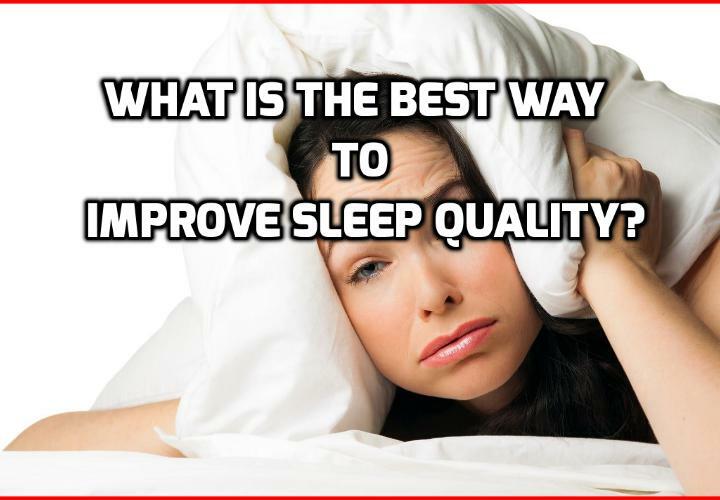 To find out more about this program, click on How to Improve Sleep Quality Fast? Can this OTC pain killer trigger high blood pressure and heart attack? What is the best way of eating to cure All diseases? Why neglecting this can absolutely increase heart failure risk ?